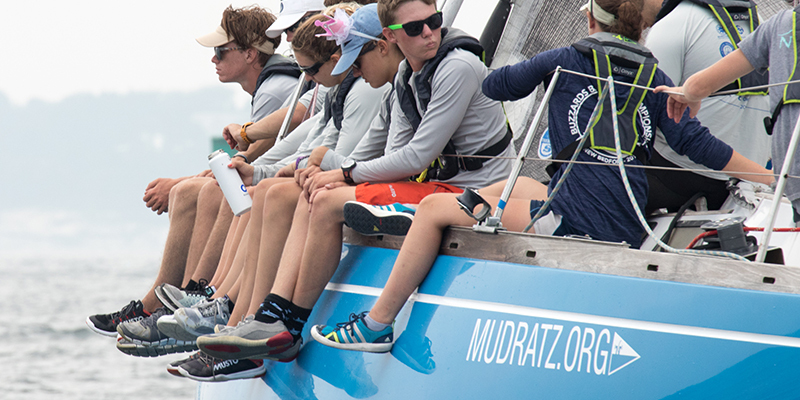 Mudratz is a unique organization based in Stonington, CT, focusing on giving kids the opportunity to gain sailing experience in offshore and long-distance racing. What makes Mudratz different? The junior sailors are in charge of the yachts, working together to get around the race course whether it be along the coast, or in the storied annual Newport to Bermuda race. Inspired by this mindset and by the desire to include an environmental education module in the program, 11th Hour Racing ambassador Anderson Reggio selected the organization as “his” ambassador grantee. 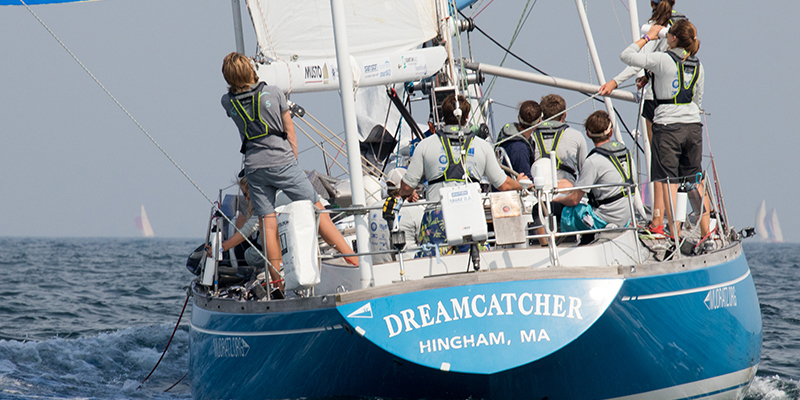 The grant empowered the Mudratz sailors to draft a sustainability plan for the team, creating a pathway and a model for the Southern New England sailing circuit. We caught up with Anderson, along with Mudratz sailors Annie Longo, Peter Cronin, Lindsay Gimple, and Megan Gimple, to learn more about the initiatives made possible by the 11th Hour Racing grant. A short video from the Mudratz team about plastic pollution witnessed while sailing from Newport to Bermuda. Q: What’s been the most daunting process of writing a sustainability plan? Annie Longo: I think the most daunting part is worrying about whether or not our efforts will be worth it. I really hope that a lot of people choose to use the plan on their own boats. Peter Cronin: The most daunting process has been the research to back it up. When developing our plan it was important to find out what exactly we did that impacted the environment in order to track and eventually eliminate these practices. Q: What has been the most rewarding part of writing a sustainability plan? Lindsay Gimple: The most rewarding part of the process so far has been sharing what we are doing! To that end, we created a green team within our organization, “MudRatz GreenFlash”, which aims to promote ocean health and environmentally sustainable practices through organized action and education of our coastal communities. So far, the response has been fantastic. Most recently, our Program Research & Advocacy Lead, Annie Longo, presented to the Eastern Connecticut Sailing Association (ECSA) junior sailing program leaders. She introduced environmental sustainability as an important element of our sport and offered suggestions on how to include discussions on ocean health and sustainable practices into youth programming. The response was so positive that Mudratz GreenFlash is working on information sheets for yacht clubs to educate their junior sailors. Q: How did you incorporate sustainability into your planning for the Newport to Bermuda race — did you face any challenges? Annie Longo: Sustainability was something that I wish we had more of an emphasis on before the Bermuda race. We were such a young team and needed to focus on learning how to sail the boat first, which presented challenges. However, we did have conversations about what type of hull cleaners and other cleaning products to use, we opted for reef-safe sunscreen, and early on in the process, we banned single-use plastic water bottles. Megan Gimple: We used different plastic-free alternatives like aluminum water bottles and thermoses for each crew member, as well as bamboo toothbrushes. A challenge we faced during the planning for the race was how to sustainably package our food for the trip, we ended up vacuum sealing our food in plastic bags, however, we were able to rinse each meal bag and then send it to a company called TerraCycle to be recycled. Q: How are Mudratz sailors working to ban single-use water bottles with ECSA and what inspired you to do this work? 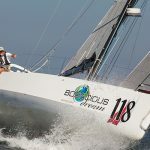 Lindsay Gimple: One thing we realized from this experience (racing from Newport to Bermuda) is that single-use plastic water bottles may seem convenient for sailing, but it is NOT much harder to utilize reusable ones. With this in mind, we are writing up a plan to eliminate single-use plastic water bottles from the ECSA area. 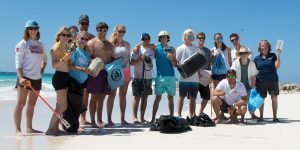 While it’s still in development, the plan relies on partnering with ECSA yacht clubs to substitute reusables for single-use plastic in regattas and junior sailing programs. Hopefully, you’ll see the impact on the racecourse this summer! Q: What’s more annoying: seeing plastic at sea, or still seeing sailors use unnecessary single-use plastic? Peter Cronin: I think it is harder to see sailors using single-use plastics than it is to see plastics in the ocean. When a sailor is using single-use plastics, very often it means they have not seen the amount of plastic floating in our oceans. I believe that if every sailor saw the amount of trash floating in the ocean, none of them would contribute to the disaster. Megan Gimple: It really annoys me to see sailors using unnecessary single-use plastic because they are some of the people that are directly affected by that choice. The ocean is a sailors’ playground, so to go out to sea and see plastic and trash in that playground is frustrating. But, knowing that the people who use the water aren’t actively trying to protect it is even more frustrating. Q: How do you think having experience in sustainability will help these junior sailors in their careers? Anderson Reggio: I think the experience the Mudratz sailors have had so far is essential for any kid growing up around the ocean. 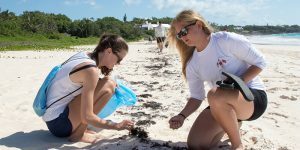 They are being taught through the program that taking care of the ocean is just the right thing to do and sustainable habits are best when started early. If they never learn bad habits, they only know of the good habits as normal behavior. If only we could all be so lucky as to see sustainably as normal! These kids are the next generation, and if they keep thinking this way, their careers will forever be impacted in a similarly positive manner. Q: What inspired you to work with Mudratz, and what’s been the most exciting part of this grant work so far? Anderson Reggio: I am originally from Eastern Connecticut, and the Mystic River Mudheads was the first yacht club of which I was a member. I’ve always had a fondness for that area of the country and still maintain close contact with many of my friends there. When Mudratz was established a few years ago, I was instantly drawn to support this program, helping wherever possible to grow it and develop it further. When this grant opportunity came about, it was a natural fit for me to attempt to join two wonderful organizations together, and I am quite excited to see this partnership succeed. Mudratz is on a mission to complement local youth sailing programs by enabling sailors to improve as a team and travel around the world. 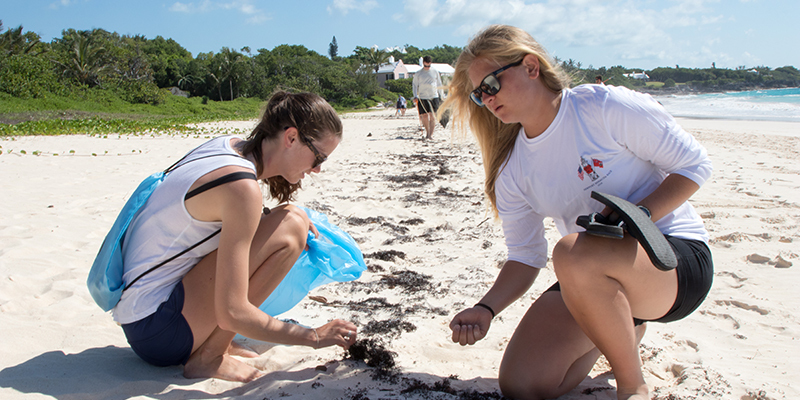 Featured in this blog, Lindsay, Megan, Annie, and Peter were all members of the Newport to Bermuda Team and currently make up the Environmental Leadership Team at Mudratz. Last year, 11th Hour Racing started a new initiative within its ambassador program. Each ambassador chooses a project with a nonprofit organization of their choice, and 11th Hour Racing supports this new initiative by awarding each organization a $10,000 grant. Learn more about this initiative here. Once they got to Bermuda, the team did a beach cleanup. The sailors found a lot of small plastic particles on the beach in Bermuda. It is almost difficult to find a photo of The Dreamcatcher without a reusable water bottle in someone’s hand!